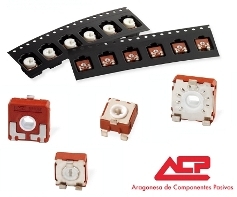 ACP potentiometers are available in Carbon and Cermet substrates, both in through-hole and in SMD technologies. Following the trend for surface mounting, ACP offers its complete product range in both configurations. Packaging can be in bulk or in Tape & Reel.